Verso, New York, 2016. 224pp., $24.95 hb. Joshua Clover aims to explain contemporary riots in relation to historical transformations of the circulation and production of capital. He predicts that riot might absolutize itself as a civil war brought about due to deindustrialization, the elimination of social welfare programs, and despite the tendency of some rioters to enter the political realm rather than riot (173). The book is not for those who are unfamiliar with Marxist concepts. However, Clover raises important questions concerning contemporary collective actions, whether they count as strikes or riots, and the conditions for their occurrence. One particular point of contention is whether violence is essential to what counts as riot. For Clover, a strike ‘struggles to set the price of labor power … features workers appearing in their role as workers … [and] unfolds in the context of capitalist production, featuring its interruption at the source via the downing of tools, cordoning of the factory floor, etc’ (16). A riot ‘struggles to set the price of market goods … features participants with no necessary kinship but their dispossession … unfolds in the context of consumption, featuring the interruption of commercial circulation’ (Ibid.). Clover describes a historical transition from riots at the ports, where circulating imports and exports were seized by a riotous public, to strikes in factories, where the means of production were sometimes broken by workers, to contemporary riots that occur in streets and squares, where the dispossessed directly interrupt the circulation of capital. Since the 1960’s and 70’s, riot has returned as ‘riot prime’ (3). The eras of riot and of riot prime both include actions that occur as ‘price-setting’, but riot prime relates differently to capital, race, police, and the state. Clover asserts that ‘a theory of riot is a theory of crisis,’ i.e. riots are linked to ‘ongoing and systemic capitalist crisis’ (1). This theory of crisis tracks an ‘arc of accumulation,’ which follows the contradictions inherent to capitalism’s historical expansion (132). In the 20th century, for example, there is first a transformation from agriculture to industry, and then deindustrialization, which globally resulted in labor moving out of industrial production and into service work, under-employment, or unemployment. ‘Crisis bursts forth at the moment that profit and expectation of profit cease flowing from manufacturing’ (136). Instead of reinvestment in production for the sake of profit, money rests in banks, or is invested in projects for the sake of generating future profits, and workers lack jobs, particularly when replaced by automation. In the first chapter, Clover argues that uses of violence cannot distinguish riot from strike. A bourgeois assumption that violence indicates a riot, and that uses of violence undermine the legitimacy and political relevance of a collective action equivocates riot and violence. In contrast, Clover argues that riots, like strikes, are legitimate and political, even if they involve violence. Clover’s second chapter describes food and export riots at various English, French, and American ports that occurred before the industrial revolution as ‘the golden age of riot’. These riots are a ‘direct physical intervention into transport’, as they struggle in relation to the ’emerging national and international markets, financing of the national purse, the commoditization of agriculture, and the corresponding destruction of communal self-sufficiency’ (56). There is then a ‘swing’ from riots to strikes, discussed in the third chapter. This swing parallels the shift away from mercantilism and toward industrialization. An ‘imperative of profit’ replaces communal values (66). England’s Swing Riots occurred when threshing machines were introduced into agriculture, and laborers lost jobs. Luddites destroyed industrial machines. Their unity lies in their demand for ’employment, better wages, better working conditions, [and] legal protections’ (68). Machine-breaking constitutes a point when ‘the swing from riot to strike’ occurs. 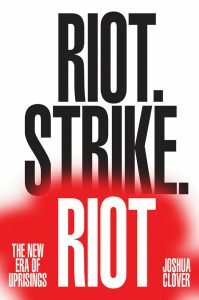 The fourth chapter adds that the distinction between strike and riot is muddled, and that ‘that muddle is the truth of things’ (88). The fifth chapter addresses the ideological association of riot with anarchism, and of strike with socialism, emphasizing that ‘the ideological opposition of tactics has helped produce the political opposition’ (89). Riot, construed as ‘insurrectionary tactics’, appears anarchistic. The “political-economic tactic” appears socialist-communist. However, these appearances are irrelevant in relation to the conditions that make strikes and riots unavoidable. Clover addresses the return of riot, i.e. riot prime, in chapter six. The years 1830 to 1973 show that strikes are strongly correlated with capital’s expansion, growth, and high profit rates. Workers would strike for increased compensation for their labor time. The crisis of 1973 occurred when attempts to continuously increase purchasing power led to inflation and capital flight, and the United States was no longer the leader of the cycle of accumulation. ‘Riot prime’ emerges as a result, and riots are racialized. When African Americans act collectively, the political rhetoric is that they riot, rather than civilly strike like their white counterparts. This rhetoric reflects the state’s view that blackness exceeds order, and cannot be regulated. However, economic factors are more relevant than racial ones. The state’s racialization of riot reflects the state’s avoidance of addressing the economic conditions from which riot emerges. Riot prime is a result of capitalism’s crises, and not race. Instead of striking directly against institutions, factories, and bosses, today’s rioters confront the police, since police are the commodity that serve commodification, protecting the market under the mask of the state. In chapter seven, Clover argues that The Long Crisis, beginning around 1973, occurs when ‘circulation prime’ emerges. Capitalism could no longer expand, and needed to move beyond the industrial sector. While strikes occurred as instances of ‘temporal struggle’ concerning labor time’s compensation, today’s riots are instances of ‘spatial struggle’ in relation to the spatial circulation of commodities exchanging places. Wage demands are now less effective, and labor is stuck in an ‘affirmation trap’ as it affirms its own exploitation for the sake of survival. Riots erupt as a result. In the eighth chapter, Clover argues that the surplus population most likely to riot is the chronically under- and unemployed, some of whom are willing to be paid less, and some of whom engage in informal, semi- or extralegal activities. Exclusion, indebtedness, and dispossession are the shared conditions common to those who participate in today’s riots. An additional condition is the state’s reduction or elimination of resources for helping them, and its resort to incarceration. ‘If the state’s solution to the problem of crisis and surplus is prison – carceral management – the riot is a contest entered directly against this solution – a counterproposal of unmanageability’ (163). This unmanageability leads the state to racialize rioters as lacking rationality, subhuman, and black. This racialization of riot is merely the state’s ideological justification of its own uses of violence and incarceration as a response to riotous collective actions. This racialization of riot reflects a ‘police-riot dialectic’ characteristic of riot prime. As noted, Clover predicts that riot might absolutize itself, ‘not [as] a demand but [as] a civil war’ (173). However, police slow this absolutization, though they tempt its potential. In the ninth chapter, Clover points to contemporary agora as ‘exemplary site[s] of circulation’ where riots occur (176). For example, Occupy Wall Street’s initial aim to block the stock exchange and interrupt the circulation of financialized capital was pushed into Zuccotti Park, and barricaded. The Occupy movement ultimately became the camp itself, i.e. a spatial occupation. Clover characterizes a ‘double riot’ characteristic of riot prime, which is constituted by the foreclosed upon youth, who riot in response to the realization that they were promised an ’empty promissory note,’ and the dispossessed, i.e. the racialized surplus population, who riot against the state’s violent management of them (180). However, while the youth declare ‘we are the 99 percent,’ the dispossessed remain dispossessed, since they are not even members of the 99 percent (181). Nonetheless, Clover hypothesizes the likelihood that these two impulses will remain, and that there will be increased disorder. Furthermore, as disorder expands, it will increasingly be revealed that this disorder belongs to the state. Riot acts against state-imposed order because the state’s order is the condition for rioters dispossession and exclusion in the first place. The more the state responds to disorder by imposing order, the more the state’s disorder is exposed as its inability to maintain order. Clover also postulates that riot prime can become the commune, which does not consist of a working class, but of a ‘heterogeneous population of those without reserves’ (189). The commune is inclusive and involves production and consumption, but without the relationships between price and wage. Riot, as a form of price-setting, is not beyond price and wage, and is not the commune. The dispossessed could see, from outside of circulation, that the market fails to provide for their needs. They could begin to provide for themselves from outside of the state-protected market. Whether Clover is correct that the commune will emerge from riot prime is unknowable. Lastly, whether riot inextricably involves violence is disputable. Certainly, not every rioter engages in physical violence against other humans, but the distinction between the two impulses mentioned above suggests that riots involve violence. Clover strains to legitimate riot prime in relation to capitalism’s crises, but can only do so by downplaying riot’s violence. Overall, the book is a difficult read, requiring the reader to sift through numerous examples in order to find the argument. Some of this could have been avoided with clear explanations. However, Clover produces an insightful historical dialectic concerning strike and riot.